The property is not only perfect as a permanent home or beach house it is also enjoys maximum investment opportunity having just realised $60,000 in the last 3 months in holiday rental return. Making a bold and innovative statement from the street, this remarkable home represents a first class merger of lifestyle and location. A sophisticated split level residence featuring a striking facade which delivers a sympathetically renovated and extended residence combining classic with contemporary finishes with a masterful combination of space and light. The entry hallway introduces the theme in fine, clear style - white, wide and airy. The home has that kind of luxe resort feel with vibrant, versatile spaces delivering outstanding flexibility before revealing a rear garden featuring a coastal landscape surrounding the entertaining areas with built-in outdoor open fireplace and in-ground solar heated pool. Accommodation incorporates two master bedrooms with WIR's and ensuite (one with private outdoor deck), two double guest rooms plus a spacious bunk room and second living/rumpus. Additionally there is a family bathroom, separate powder room and separate laundry. 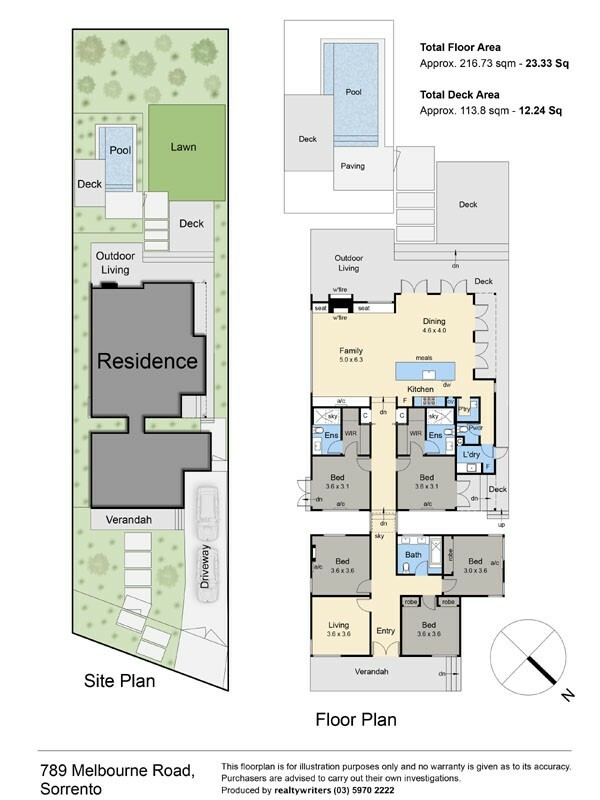 The open plan living, dining and kitchen sprawls out across the width of the back of the house with OFP, banquette window seats and glass doors opening up to the rear lawn, garden and pool. Offering every conceivable modern luxury with carefully selected surfaces including timber features in floors, wall panelling and kitchen cabinetry plus large areas of glass and floor-to-ceiling windows providing garden vistas. Position plus - just a stroll into Sorrento Village to enjoy its cafes, shops and galleries, this is Sorrento living at its best. Land size is 945 sqm (approx).